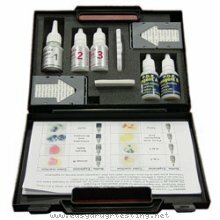 Detox products: DropEx Plus Explosives Detection Field Test Kit. Pass drug tests, passing all drug test. This product only can be shipped in US only Drop-Ex Plus is our newest Explosive Detection and Identification Kit. Now it is includes P.D.K. explosive field test kit and as a result could also detect improvized chlorates based and peroxide based explosive compounds. This system is based on the same reagents in Expray, but in a drop tube deliverable system, for ease of use during field and laboratory investigation. This kit is also able to detect an additional category of explosives: chlorates. When using drop # 4 for detection of chlorates (also for bromides) this drop is used by itself and does not require drops # 1, 2, or 3 to precede it. If you are not sure what type of explosive you are testing for, you will need two samples. The first sample can be tested using Drop-Ex 1, 2 and 3. The test for chlorates and bromides must be a separate test using Drop-Ex 4. Drop-Ex-1 for Group A Drop-Ex-1 is used to search for GROUP A type explosives which include TNT, Tetryl, TNB, DNT, picric acid and its salts. To use, wipe suspected surface with special collector test paper. Drop with Drop-Ex-1. If a dark brown-violet color appears, this indicates the presence of TNT; An orange color indicates the presence of Tetryl and other GROUP A explosives. Drop-Ex-2 for Group B Drop-Ex-2 is used to search for GROUP B type explosives which include Dynamite, Nitroglycerine, RDX, PETN, SEMTEX, Nitrocellulose and smokeless powder. If after Drop-Ex-1 there is no color change, use Drop-Ex-2. The almost immediate appearance of a pink color change indicates the presence of GROUP B explosives. Most plastic types of explosives belong to this group, including C-4 and Semtex. Drop-Ex-2 for Group B Drop-Ex-2 is used to search for GROUP B type explosives which include Dynamite, Nitroglycerine, RDX, PETN, SEMTEX, Nitrocellulose and smokeless powder. If after Drop-Ex-1 there is no color change, use Drop-Ex-2. The almost immediate appearance of a pink color change indicates the presence of GROUP B explosives. Most plastic types of explosives belong to this group, including C-4 and Semtex. Drop-Ex-3 for Nitrates Drop-Ex-3 is used to search for nitrate-based explosives which includes ANFO (ammonium nitrate-fuel oil), commercial and improvised explosives based on inorganic nitrates, black powder, flash powder, gun powder, potassium chlorate and nitrate, sulfur (powder), and ammonium nitrate (both fertilizer and aluminum). If there is still no reaction after using the Drop-Ex 1 and 2, but presence of explosives is still suspected, drop the same paper with Drop-Ex-3. A pink reaction indicates the presence of nitrates, which could be part of an improvised explosive. Drop-Ex-4 for Chlorates and Bromides Drop-Ex-4 is used to search for chlorates (such as potassium chlorate and sodium chlorate) and bromides. If you suspect a chlorate or bromide, use Drop-Ex-4. If there is a dark blue reaction, there is the presence of chlorates or bromides. If you have already tested with Drop-Ex 1, 2 and/or 3, you must use a fresh sample for Drop-Ex-4. P.D.K. Reagent A and B used to search for improvized chlorates based and peroxide based explosive compounds.